The CVE Group, an Independent French producer of renewable energy headquartered in Marseille, continues its strong growth. It plans to expand its workforce in France by 30% in 2019. CVE seeks to become a leader in independent decentralized renewable energy for businesses and communities. The Group pains to have 1.4 GWp operational and under construction in 2023. This is equivalent to the power consumption of a city of 1.6 million people. To achieve this, CVE is continuing its ambitious recruitment policy, with about thirty hires on open-ended contracts planned in France this year. In 2019, CVE is planning to boost its staff in its sales, financial, technical, and support functions. The group contains a full range of expertises within it, covering all the skills required for the development, financing, construction, and operating renewable production units and green energy sales. In all, more than 30 job profiles are represented within CVE. In France, CVE is particularly looking for three Business Developers for its Solar and Direct Sales activity, and a Digestates Recycling Manager for its Biogas & Methanation business. For its more recently started Hydropower business, the Group is seeking a developer. For its head office in Marseille, CVE is looking for an Accounting Director, an International Accountant, a Financial Analyst, and a Business Attorney. Between December 2017 and October 2018, CVE increased its workforce significantly, particularly to build up its subsidiaries in Chile and the United States. The Group now has 110 employees, of whom 90 are based in the Marseille head office. All our job offers are available here. “Since CVE was created, we have been convinced that we will need to give meaning to the company’s plans and to the tasks that flow from it for our teams. Our employees are contributors in full to the collective success of CVE owing to the high level of autonomy, initiative, and responsibility that we grant them. Additionally, all of them have a stake in that success through a program for sharing the proceeds from our growth. This has set us apart in a tight job market,” explains Pierre de Froidefond, one of CVE’s three founding partners alongside Christophe Caille and Hervé Lucas. A key player in France’s energy transition, CVE produces decentralized renewable power from solar, hydroelectric, and methanation sources. The Group’s goal is clear: To meet the energy and environmental needs of businesses and communities in a direct energy sales model. 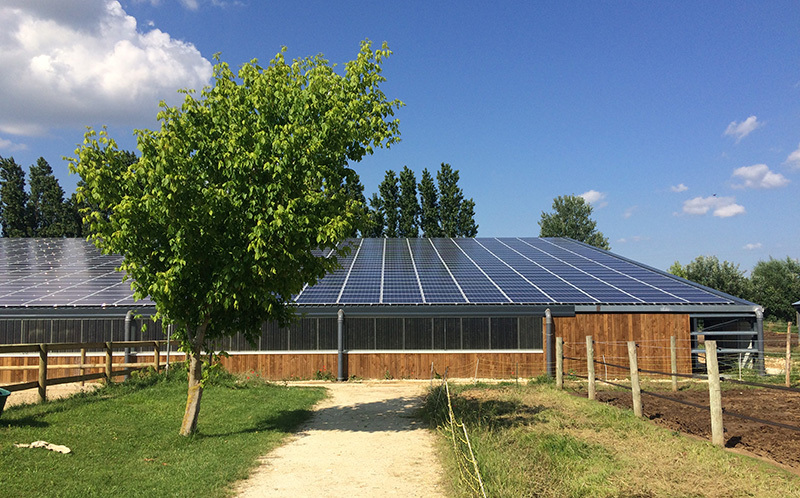 Cap Vert Energie operates 42 photovoltaic plants in the South of France, which produce 25 gigawatt-hours of electricity per year, avoiding 2200 tons of CO2 emissions annually. In Bouches-du-Rhône, the Group notably fitted Méditourbe’s site with 5.3 hectares of photovoltaic rooftops, making it one of the largest industrial solar rooftops in France, with an annual production of 9.6 GWh of electricity, equivalent to the power consumed by 8,000 people at home.